Carpeting and area rugs are big magnets for stains, especially if you have kids and pets. Here’s a stain remover cleaning tip that really does work! 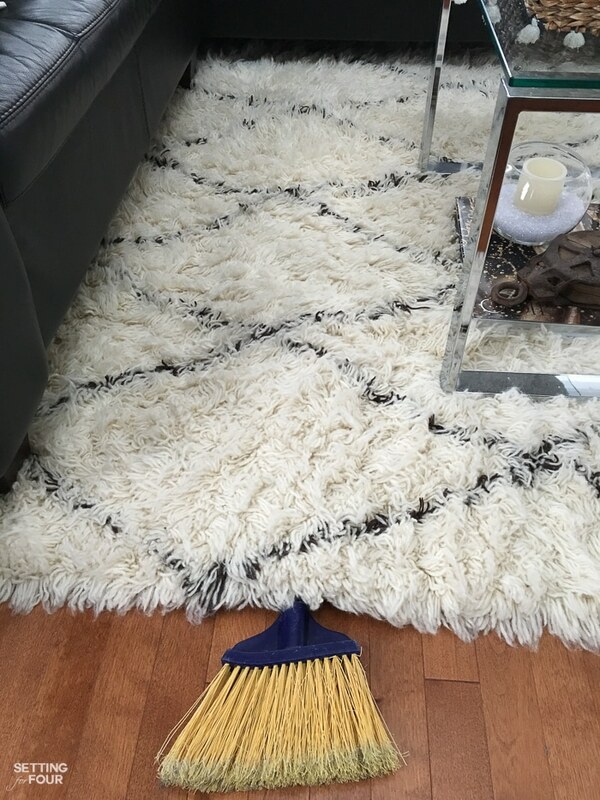 I had a big accident a few months ago and spilled a cup of black tea on our gorgeous ivory wool Moroccan shag area rug in our family room! 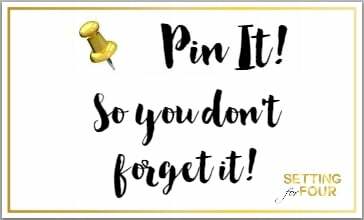 It left a huge brown mark on our cream colored rug – I was completely freaking out when it happened! Although I immediately soaked up all the wet tea – I couldn’t remove the stain. I was in a big big panic! I cleaned it with some mild soapy water and tried oxyclean, neither worked. It dried and sat for 3 months- I had no clue how to remove it. The cleaning instructions on our rug recommended professional cleaning but taking it to a professional cleaner not only would be a huge hassle (moving our sectional and end tables wasn’t something I was thrilled to do!) but it would also be really expensive…. so that wasn’t an option. I was stumped until I figured out a solution! 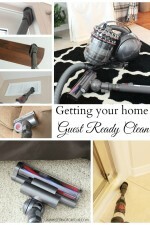 Here is what I did to completely remove the stain – and it’s really quick, easy and inexpensive! I’m so thrilled this cleaning trick worked. Here’s the tea stain! It was really hard to photograph…. but believe me it was very brown and about the size of a dinner plate! Wool is really hard to clean. Because it’s a natural fiber you can’t just use harsh chemical cleaners on it or cleaners that might bleach the natural color out of it. So this is what I used that’s completely safe to use on wool! 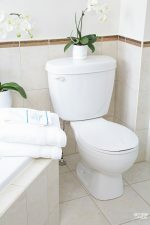 Immediately soak up as much liquid as you can with paper towels, sponges or cloths. Blot the liquid so that the stain doesn’t spread any more than it has. My stain had dried completely and was about 3 months old. I poured the 3% hydrogen peroxide straight out of the bottle into the plastic bottle cap. I did not dilute it with water. NOTE!!!!! PLEASE DO A TEST SPOT FIRST ON YOUR CARPET TO MAKE SURE THAT NO DISCOLORATION APPEARS. Because my area rug is shag with long carpet fibers I laid a few of the stained rug fibers into the hydrogen peroxide letting them completely soak up as much peroxide as possible. The solution wicked up along the whole length of the carpet fiber. I moved along the entire stain until it was completely treated with the hydrogen peroxide. You could also use an eye dropper to drop some hydrogen peroxide right onto your carpet. Because we have hardwood flooring underneath our area rug I put a broom under the treated area to prop the rug up and away from the floor – so it wouldn’t be in contact with the hardwood and possibly mark it! This trick also helped dry it out. I left it like this overnight. I did not blot the carpet after I treated it with the hydrogen peroxide. The next morning the treated area was dry and the stain was almost gone! I repeated the steps for another round of hydrogen peroxide treatment and left it overnight. The next day the stain was completely 100% gone! 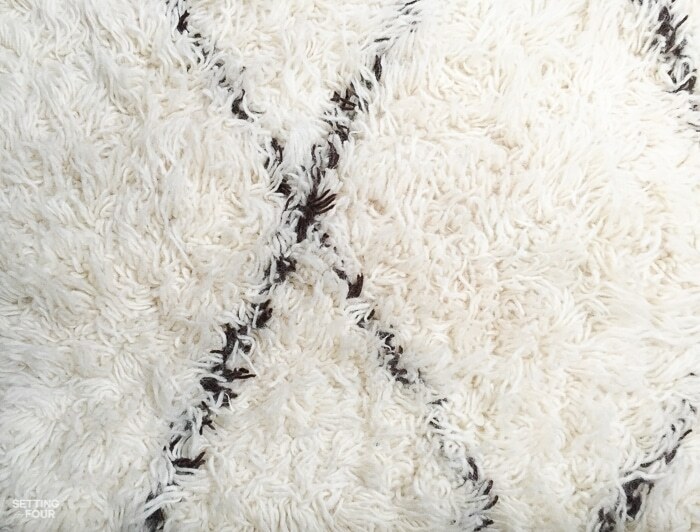 I was absolutely amazed and so so excited that my beautiful area rug was back to it’s original gorgeousness! The hydrogen peroxide did not discolor the carpet at all – it returned it to it’s beautiful ivory color. By the way – I got the hydrogen peroxide on some of the black rug fibers too and they weren’t bleached or discolored at all. Because of where the stain was and the pattern in our rug – I couldn’t avoid getting it onto the black areas. I’m so thrilled with how well this cleaning trick works! FYI – I imagine you could use this cleaning tip on wool sweaters too. 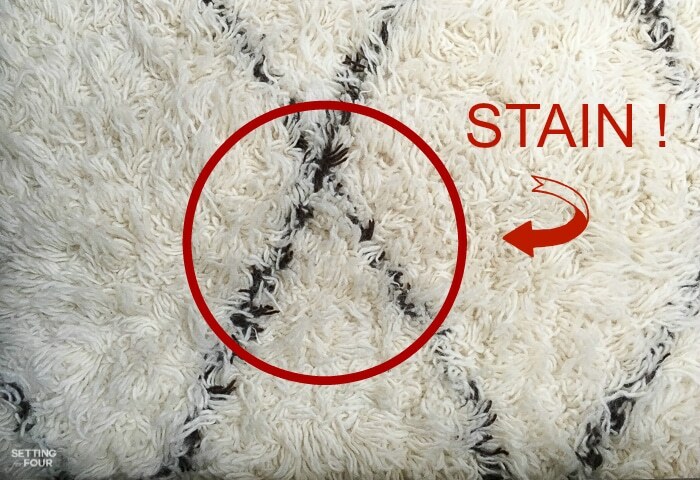 I’m so happy to have gotten that stubborn stain out of our wool area rug with this super quick and inexpensive cleaning trick! 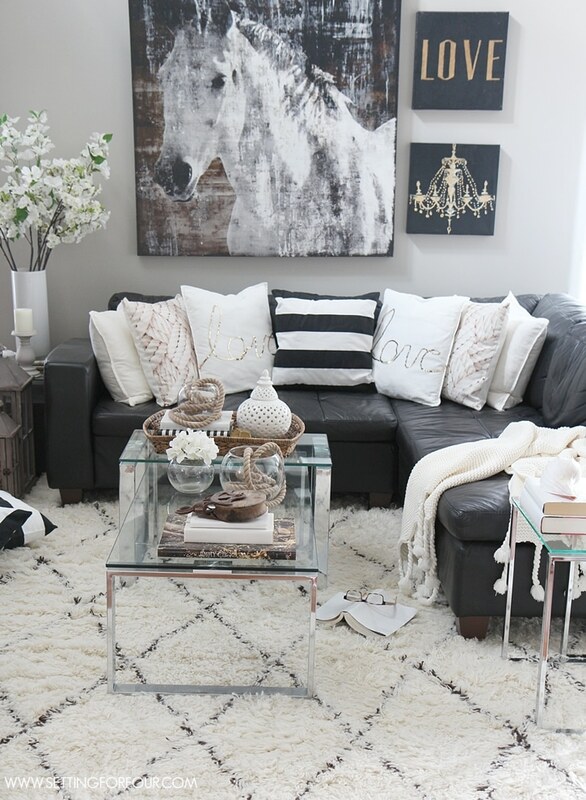 Shop the look of our family room. See all of my paint colors here. 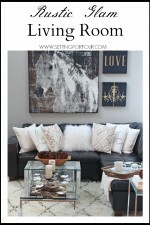 Shop my home here to see my furniture and decor! 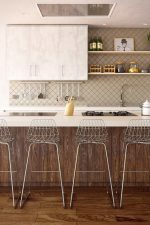 Horse Art Decor – 20 Stunning Looks! Than you so much for that tip, I will be trying it. You are very welcome Karen!! I’m glad you find this tip helpful! I’m so excited that I saved our beautiful rug – it was really bugging me seeing that stain every day! Thanks for the tip and peroxide is really economical as well. Oh awesome! That’s so good to know!